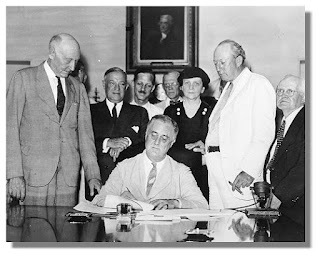 Today marks the 77th anniversary of the signing of the Social Security Act, and even though it's not one of those anniversaries we might consider A Big One, it's important. For this reason: it may well be the last time any of us will be able to celebrate this landmark law without also being reminded of its untimely death. Two years ago, when we celebrated Social Security's Diamond Anniversary (well, some of us did) the usual rumblings against the best and brightest of our safety net programs could be heard, but since they were far off and not unlike anything we had heard before (and since the Democrats were still in the majority), we did the usual and just ignored them. Two years later, they're not just rumblings, they're lightning strikes. Even the folks who have the most to gain from the continuance of Social Security are getting ready to cast their ballots for the very politicians who are not just promising but itching to kill it dead. Mitt Romney and his cohort, the SS-hating Paul Ryan, would like nothing better than to get the chance in November to kill off all such safety nets once and for all. If they win the presidency, we can kiss goodbye any hope of saving Social Security and its offspring, Medicare and Medicaid. The only reform we'll see is a slow elimination or corruption or privatization of the social programs many more addled Americans have now been lulled into associating with "Big Bad Government." Roosevelt envisioned creating a long-term safety net that would eventually be self-sustained by payroll deductions when everyone got back to work, but he was adamant about the need for the Federal government to start these payments before the coffers were filled. His idea was that the normal safety nets had long disappeared, the country was in trouble, and the government had a moral duty to help out. In the important field of security for our old people, it seems necessary to adopt three principles: First, non-contributory old-age pensions for those who are now too old to build up their own insurance. It is, of course, clear that for perhaps thirty years to come funds will have to be provided by the States and the Federal Government to meet these pensions. Second, compulsory contributory annuities which in time will establish a self-supporting system for those now young and for future generations. Third, voluntary contributory annuities by which individual initiative can increase the annual amounts received in old age. It is proposed that the Federal Government assume one-half of the cost of the old-age pension plan, which ought ultimately to be supplanted by self-supporting annuity plans. The amount necessary at this time for the initiation of unemployment compensation, old-age security, children's aid, and the promotion of public health, as outlined in the report of the Committee on Economic Security, is approximately one hundred million dollars. 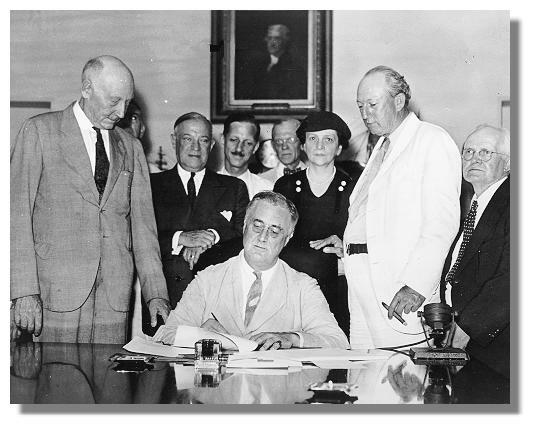 Five years ago the term "social security" was new to American ears. Today it has significance for more than forty million men and women workers whose applications for old-age insurance accounts have been received; this system is designed to assure them an income for life after old age retires them from their jobs. It has significance for the needy men, women and children receiving assistance and for their families--at least two million three hundred thousand all told; with this cash assistance one million seven hundred thousand old folks are spending their last years in surroundings they know and with people they love; more than six hundred thousand dependent children are being taken care of by their own families; and about forty thousand blind people are assured of peace and security among familiar voices. It has significance for the families and communities to whom expanded public health and child welfare services have brought added protection. And it has significance for all of us who, as citizens, have at heart the Security and the well-being of this great democracy. These accomplishments of three years are impressive, yet we should not be unduly proud of them. Our Government in fulfilling an obvious obligation to the citizens of the country has been doing so only because the citizens require action from their Representatives. If the people, during these years, had chosen a reactionary Administration or a "do nothing" Congress, Social Security would still be in the conversational stage--a beautiful dream which might come true in the dim distant future. But the underlying desire for personal and family security was nothing new. In the early days of colonization and through the long years following, the worker, the farmer, the merchant, the man of property, the preacher and the idealist came here to build, each for himself, a stronghold for the things he loved. The stronghold was his home; the things he loved and wished to protect were his family, his material and spiritual possessions. His security, then as now, was bound to that of his friends and his neighbors. But as the Nation has developed, as invention, industry and commerce have grown more complex, the hazards of life have become more complex. Among an increasing host of fellow citizens, among the often intangible forces of giant industry, man has discovered that his individual strength and wits were no longer enough. This was true not only of the worker at shop bench or ledger; it was true also of the merchant or manufacturer who employed him. Where heretofore men had turned to neighbors for help and advice, they now turned to Government. Now this is interesting to consider. The first to turn to Government, the first to receive protection from Government, were not the poor and the lowly--those who had no resources other than their daily earnings--but the rich and the strong. Beginning in the nineteenth century, the United States passed protective laws designed, in the main, to give security to property owners, to industrialists, to merchants and to bankers. True, the little man often profited by this type of legislation; but that was a by-product rather than a motive. Taking a generous view of the situation, I think it was not that Government deliberately ignored the working man but that the working man was not sufficiently articulate to make his needs and his problems known. The powerful in industry and commerce had powerful voices, both individually and as a group. And whenever they saw their possessions threatened, they raised their voices in appeals for government protection. It was not until workers became more articulate through organization that protective labor legislation was passed. While such laws raised the standards of life, they still gave no assurance of economic security. Strength or skill of arm or brain did not guarantee a man a job; it did not guarantee him a roof; it did not guarantee him the ability to provide for those dependent upon him or to take care of himself when he was too old to work. Long before the economic blight of the depression descended on the Nation, millions of our people were living in wastelands of want and fear. Men and women too old and infirm to work either depended on those who had but little to share, or spent their remaining years within the walls of a poorhouse. Fatherless children early learned the meaning of being a burden to relatives or to the community. Men and women, still strong, still young, but discarded as gainful workers, were drained of self-confidence and self-respect. The millions of today want, and have a right to, the same security their forefathers sought--the assurance that with health and the willingness to work they will find a place for themselves in the social and economic system of the time. This is what we're fighting to save. The moral code of this country, as spelled out by the founders, has always dictated that government is there to serve the needs of the people. Sometimes that's ignored, as Roosevelt himself infers in his radio address, but it's never forgotten. Even now, it's not forgotten. Not by us. Reading through Roosevelt's statements on Social Security, it's clear that he intended to work tirelessly to do what was right for the people still suffering from the effects of a man-made, wholly unnecessary depression. We need to remind our leaders today--also to blame for a wholly unnecessary depression--that social safety nets are an obligation they've inherited, and are, in fact, an obligation they agreed to when they took their oaths of office and vowed to uphold the constitution. So let's get to the meat of it: President Obama is no Roosevelt. Not even close. But in my heart of hearts I believe he knows in his heart of hearts what he should do. So far he hasn't done it well, but there's no denying baby steps have been taken. He dropped the ball early on and hasn't recovered it yet, but there's hope. With President Obama, there's hope. If Mitt Romney is elected president, either because of or in spite of his running mate, in all likelihood the Republicans will take both the House and the Senate, and that will be the end of Obamacare, of Social Security, of Medicare and Medicaid, of any chance at easing the conditions of the poor and middle class and rebuilding a country nearly devastated by a man-made economic crisis not of our choosing and not of our making. How do we get that message out? I don't know, but it can't hurt to keep reminding voters that once upon a time, in conditions much like these, something happened in this country that changed us forever. Our government took charge and did, not just what they were elected to do, but what they were morally obligated to do. They took care of a nation in mortal pain. And the country survived. It thrived. So much so that, until this latest man-made fiasco, we were still seen as the greatest nation in the world. We could keep reminding them of that. Mar. 1933 would have been the beginning of FDR's FIRST term. Well, poo! Of COURSE! Thanks, Kulkuri. You're the first to notice--I think. Changed now. A very informative article.As a Dane I can't vote for Obama,but I hope for America that he win.A Romney win will be a disaster. Thanks for commenting, Pjevs. We're a mess here in America, and, yes, a Romney win WOULD be a disaster.